Welcome to the Giveaway Hop for all of you that love... 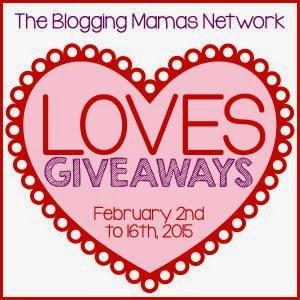 Giveaway Hops, hosted by the Blogging Mamas Network. You know BMN LOVES giveaways, so we've come together to bring you a fun, open-themed giveaway hop! Each blogger has a prize valued at $25 or more, so be sure to "hop" around on the linky at the bottom of the post to check out each prize! Here on Mommy's Favorite Things we have Glasstic. They are offering 3 bottles of choice, worth $60! So Easy Being Green, Viva Veltoro, the Blogging Mamas Network, and the BMN Loves Giveaways participating bloggers are not responsible for sponsors who do not fulfill prize obligations. I might choose the colors pink, blue, and green. I love the retro green design, blue peace design and the love pink design! I would choose the black, blue and purple. I would love to get the tribal ying yang design. I like the colors. I would choose Peace, Love, & Yin Yang! I love the purple bottle! 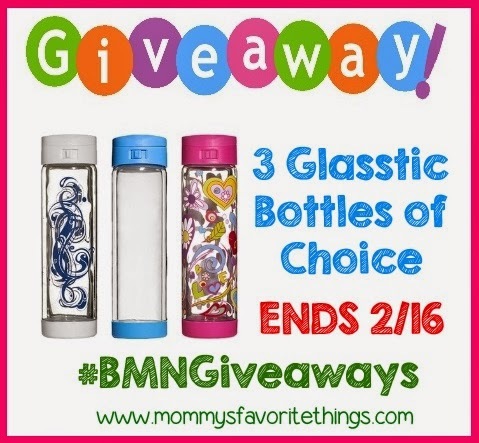 I like the pink love bottle and the clear bottle with blue top. If I were lucky enough to win, I think I would choose the Clear with White, Clear with Black, and the Blue Peace design. I like the love design pink flip cap, the retro design green flip cap and the tribal ying yang design white flip cap. I'd love the Purple, Blue and White if I won! I would choose pink or purple. I like the Love Design Pink Flip cap and the blue peace design and the green one too! I like the Retro Design, the Tribal Ying Yang Design, and the clear with the blue lid. I would choose black, blue and pink! One I'd choose is the Glasstic 16oz - Retro Design Green Flip Cap. Thanks. I would choose black, blue and the retro green design. I really like the Retro Design in Green! I like the black, green and blue clear ones. I htink I would get the Love Design Pink, purple and the tribal Ying Yang Design white. Tribal Ying Yang Design, pink and blue. Would choose the designer pack. I like the Retro Design, the Tribal Ying Yang Design and the clear one with a green lid! I would choose peace, love, and black. I like the love design with pink flip cap. I like the love design with the pink cap. I was thinking purple, pink, and blue. I'd get peace, retro and love. I would choose the Retro green, pink, and blue. I have never seen these before and love them. I would choose green - it looks clean and fresh. I like the Tribal Ying Yang design, the Retro design, and the purple lid. I would probably choose 2 Tribal Ying Yang Designs and 1 of the black flip cap ones. I like the purple one. I would choose the love design in pink, the retro design in green and the Glasstic Worry Free Glass Water Bottle - Love Design. I would pick the purple color bottle. I think I'd go with the Tribal Ying Yang, the Retro Design Green, and maybe just black! They're all nice! I like the Tribal Ying Yang design, the peace design, and the love design. These would make excellent gifts! I'd like purple, green and blue. I LIKE THE BLUE PEACE DESIN, THE PINK LOVE DESIGN, AND THE TRIBAL YING YANG DESIGN. I love Glasstic -16oz Clear Glass - Green Sports Lid. I like the green retro, the tribal ying yang, and the blue lid bottles. I like tribal ying yang, love, and blue. I like the black, green, and purple flip lid Glasstic bottles. If I win, I would pick the Black Flip Cap, Green Flip Cap & Black Flip Cap! I would get the blue, green, pink and black. I would choose the blue, purple and black. I like the Peace Design Blue Flip Cap, Purple Flip cap and the Green Flip cap. I like the tribal ying yang design and maybe some of the no colored ones. I like the pink color. I would love to have the Glasstic -16oz Clear Glass - Green Sports Lid!